Folsom Lake RV is proud to be your number one Sacramento, Rancho Cordova, Northern California area RV Dealer. 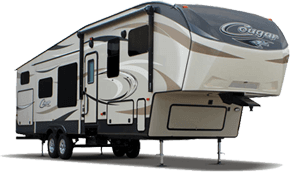 We offer California RV Sales of Fifth Wheels and Travel Trailer from Montana, Montana High Country, Cougar, Durango, Bullet, Springdale and more. Looking for Teardrop Trailers? We have Little Guy Max, the top choice in Teardrop Trailers. We also carry Aliner brand A-Frame Trailers, and a large selection of Toy Haulers including Venom, Sportsmen LE and Genesis Supreme. If you're in the market for quality pre-owned RVs, we carry all types and price ranges, and we proudly offer a Certified 90 Day Warranty on most Used RVs. Here at Folsom Lake RV in Rancho Cordova, CA we have a huge RV Parts and RV Accessories Department and a full RV Service Center on site. So, if you need to replace a worn or broken RV Part, or maybe you are just looking to upgrade your RV with some new RV Accessories like LED lighting, we have them at great prices. Our RV Service Center is here to help you install parts and accessories like solar panel arrays, satellites, and fifth wheel slider hitches and perform routine maintenance on your RV. Best of all, Folsom Lake RV is here to help you save money on your next RV. Our RV Financing Department will help you get into the RV of your dreams with low monthly payments. Stop in today to see how we can save you money and get you into the RV of your dreams! If you're thinking about selling your RV, we can help. Click to learn about our RV Consignment service or call our sales department at 916-635-4545.